In a large bowl, whisk together flour, brown sugar, baking soda, baking powder, salt, cinnamon, and all-spice. In a small bowl, whisk together buttermilk, applesauce, oil, egg, and vanilla extract. Pour the wet ingredients over the dry ingredients and mix with a wooden spoon or spatula until just combined. Do not over mix. Gently stir in the grated apple and zucchini. 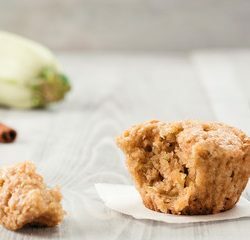 To make the topping, combine raw sugar and cinnamon in a small bowl. Stir well. Preheat oven to 350F. Scoop out seeds (leaving plenty of zucchini meat on the rind) and set aside. In a large bowl, combine chicken, cream cheese, 3/4 cup cheddar, buffalo sauce, and green onions and season with salt and pepper. 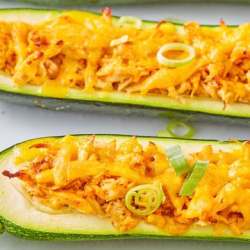 Spoon chicken mixture into the zucchini boats and sprinkle with remaining 1/4 cup cheddar. 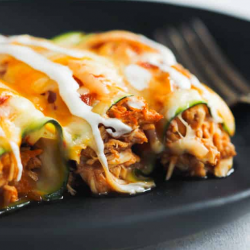 Bake until zucchini is tender and cheese is golden, about 15 minutes. Garnish with more green onions and serve. Preheat oven to 350°. In a small bowl, whisk together flour, salt, baking soda and cinnamon. In a large bowl, beat together sugars and butter until light and fluffy. Add egg, yogurt and vanilla and mix until evenly combined. Fold in oats, chocolate chips and zucchini. 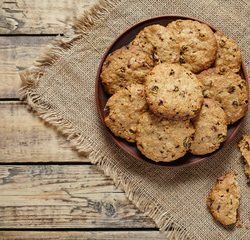 Drop by rounded teaspoon 2 inches apart on baking sheets. Bake for 10-12 minutes. Let cool for 2 minutes on baking sheet and transfer to wire rack to cool completely. In a large pot, heat about 2″ oil over medium heat until a deep-fry thermometer reads 350F. Combine flour and salt in a medium bowl, then whisk in beer until almost smooth (some small lumps are welcome—don’t over whisk or you’ll deflate the batter). One by one, dredge the blossoms in batter, shaking off the excess; gently lay them in the oil, without crowding the pan. Cook, flipping once with a slotted spoon, until golden brown, 2-3 minutes total. Transfer to paper towels to drain. Sprinkle with sea salt and devour while hot. Preheat oven to 350F. In a large skillet over medium heat, heat oil. Add onion and season with salt. Cook until soft, 5 minutes, then add garlic, cumin and chili powder and stir until combined. Add shredded chicken and 1 cup enchilada sauce and stir until saucy. Bake until the cheese is melted and sauce bubbles on the edges, 20 minutes. Garnish with sour cream & cilantro and serve. 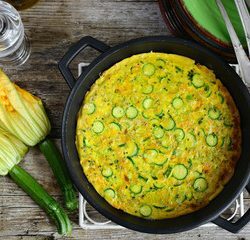 In a large bowl, combine shredded zucchini with onion, eggs, and garlic powder. Season with salt and pepper and stir to combine. Mix in Parmesan and flour and stir until fully incorporated. In a large skillet over medium-high heat, heat olive oil. For each fritter, scoop ¼ cup batter into skillet and cook until golden, 2 minutes per side. In a small bowl, combine marinara with basil, garlic and red pepper flakes. Preheat grill on high. In a large bowl, toss zucchini with olive oil, garlic powder, red pepper flakes, and lemon zest. Season with salt and pepper. Once grill is hot, carefully use tongs to rub an oiled paper towel over grates to clean. 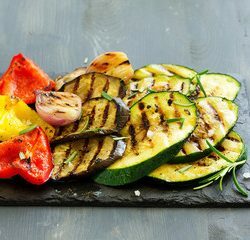 Using tongs, place zucchini on grill. Cover and cook, 2 minutes. Flip and continue cooking on high, covered, 2 minutes more. Reduce heat to low, flip zucchini, and brush lightly with balsamic vinegar. Continue cooking up to 1 minute, uncovered. Serve warm. Heat oven to 400F. Slice each zucchini crosswise, like an accordion, making sure not to cut all the way through zucchini. Drizzle with olive oil and top with Parmesan. Season with salt and crushed red pepper flakes. Bake until tender and golden, about 25 minutes. 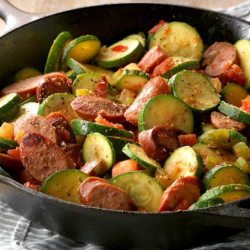 In a large skillet, cook sausage and onion until meat is no longer pink; drain. Stir in the zucchini, tomatoes, lemon juice, salt, oregano and pepper sauce. Cook, uncovered, for 5 minutes, stirring frequently. Garnish with cheese. Preheat oven to 425F. Slice off both ends of zucchini and discard. 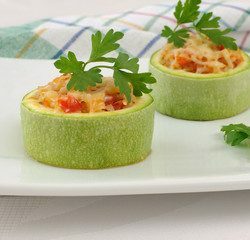 Cut zucchini into 2″ rounds. Carefully hollow out the zucchini to 1 1/2″ deep (leaving a decent amount on flesh on the rinds). Place zucchini on a parchment-lined rimmed baking sheet and bake until pliable, 10 minutes. 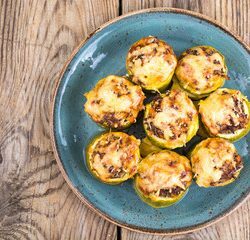 Meanwhile, make jalapeño popper filling: in a medium bowl combine cream cheese, 1/2 c mozzarella, cheddar, bacon, jalapeño and garlic powder. Season with salt and pepper and stir until fully combined. Remove zucchini from oven and stuff jalapeño mixture in each round. Top with remaining mozzarella and bacon and bake until cheese is melted, 6 to 8 minutes. Garnish with parsley and serve. Preheat oven to 350F. Grease a baking sheet with cooking spray or olive oil. In a large skillet over medium heat, heat oil. Add onion and cook until tender, about 5 minutes. Stir in garlic and cook until fragrant, about 30 seconds. Add ground beef, breaking up the meat with a wooden spoon. Season with oregano, salt and pepper, and cook until the beef is no longer pink, around 6 minutes. Drain fat. Add crushed tomatoes and bring mixture to a simmer. Cook for 5 minutes then stir in ricotta and remove from heat. Cut zucchini crosswise into 3″ pieces. Using a half teaspoon, scoop out zucchini flesh to create wells. Transfer to prepared baking sheet and fill with meat mixture. 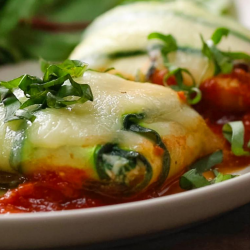 Top with mozzarella and Parmesan and bake until the cheese has melted and the zucchini is tender, 20 to 25 minutes. Preheat oven to 350F and spray a large baking dish with cooking spray. In a medium bowl, combine ricotta, 1/2 cup Parmesan, egg, garlic, and Italian seasoning. Season with salt and pepper and mix until well combined. 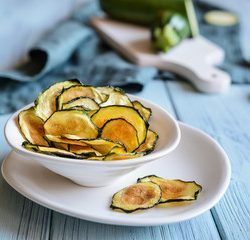 On a clean working surface, lay out three slices of zucchini so they are slightly overlapping and place a spoonful of the ricotta mixture on top. Roll up and transfer to the prepared baking dish. Repeat with remaining zucchini and ricotta mixture. Spoon marinara on top of the zucchini manicotti, then sprinkle all over with the remaining 1/2 cup Parmesan and mozzarella. 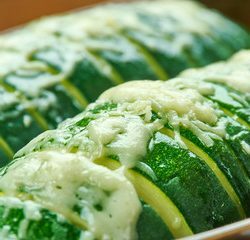 Bake until the zucchini is tender and the cheese has melted, about 30 minutes. Garnish with fresh basil then serve immediately. In a saucepan, heat the olive oil and add the garlic, leeks and zucchini. Stir in the salt and pepper. Cook, stirring often, 3-4 minutes, until the leeks have softened. Add 1 cup of the broth, cover and cook, stirring every once in a while, until the zucchini is falling apart and very tender, 8-10 minutes. Transfer the mixture to a blender and add the basil. Carefully blend (in batches if needed). Pour the soup back into the pot. Stir in the remaining 1 cup of chicken broth. Stir in the chopped spinach and cooked chicken and cook until heated through, 4-5 minutes. Preheat oven to 225F. Line two large baking sheets with silicon baking mats or parchment paper. Slice your zucchini on a mandolin. Combine the quinoa and 2 1/2 cups water in a medium pot and bring the water to a boil. Reduce the heat so the water gently simmers. Cover and simmer 15 minutes. In another pan, lightly sauté the zucchini in olive oil, lemon and garlic. Remove the pot of quinoa and the zucchini from the heat. Let the quinoa stand, covered, until tender, about 5 minutes. 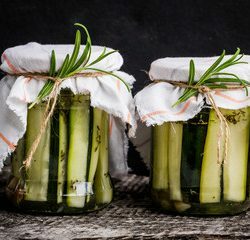 Allow the zucchini to cool. Drain the quinoa in a sieve and let cool completely. 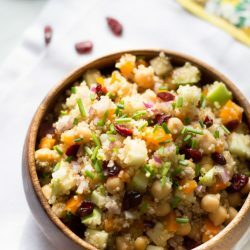 Just before serving, place the quinoa, chickpeas, sautéd zucchini, preserved lemon, cranberries, cilantro, shallots, lemon juice, oil, salt and pepper in a large bowl and toss to combine. Preheat oven to 375F and grease a large baking dish with olive oil. 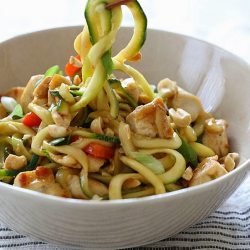 Assemble the Ravioli: Lay two strips of zucchini noodles so that they overlap lengthwise. Lay two more noodles on top, perpendicular to the first strips. You should end up with a “T” shape. Spoon about 1 tablespoon of filling in the center of the zucchini. Bring the ends of the strips together to fold over the center, working one side at a time. Turn the ravioli over and place in the baking dish seam-side down. Repeat with remaining zucchini and filling. 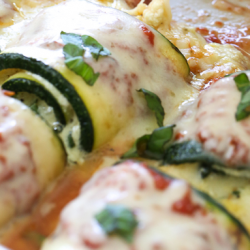 Pour marinara around the zucchini and top ravioli with mozzarella. Top with remaining basil and Parmesan and serve. On a cutting board, lay zucchini slices down horizontally (so that the long side is facing you). 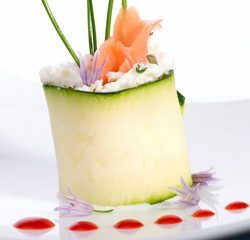 Spread a thin layer of cream cheese on top of zucchini, then top the left side with a pinch each of crab or salmon, carrots, avocado and cucumbers. Heat oven to 400F. Line a baking sheet with parchment paper. Put zucchini in a strainer and lightly salt. Let sit in the sink or over a bowl to drain as much moisture as possible, about 20 minutes. 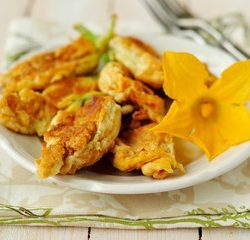 In a large bowl, mix together zucchini, flour, cheese, egg, and garlic powder. Season with pepper. Scoop 1/4-cup portions of the mixture onto the baking sheet, then press each gently down until 1/8-inch thick. Bake until the shells are lightly browned and crisp, about 25 minutes. Let cool slightly, then fill with toppings of choice. Preheat oven to 350F. Spray the sides of a nonstick Bundt pan with cooking spray. Put flour, cinnamon, allspice, salt and baking soda in a large bowl and whisk together completely. Combine eggs, 2 cups sugar, oil, ½ cup cream and 1 teaspoon lemon juice in a large bowl. Add zucchini and mix well. Add wet mixture to flour mixture and stir just until blended. Pour melted butter into the Bundt pan. Layer brown sugar evenly over butter. Toss the peach slices with remaining 1 teaspoon lemon juice and arrange over brown sugar. Sprinkle with pecans. Pour the zucchini batter into the pan over the pecans. Bake in 350°F oven for 55-65 minutes or until a toothpick inserted in the middle comes out clean. In the meantime, whip the remaining ½ cup of whipping cream in a chilled bowl till soft peaks form. 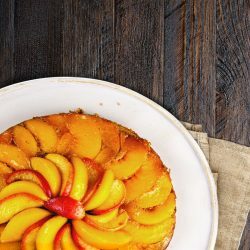 Add remaining 1 teaspoon of sugar and peach liqueur, and continue to whip until firm peaks form. Loosen sides of the cake with a nylon spatula. Immediately place heatproof serving plate upside down over the pan; turn plate and pan over. Leave pan over the cake a few minutes so that all the gooey topping falls onto the cake. Then remove the pan to reveal your masterpiece! Serve warm with the whipped cream. Store cake loosely covered. Beat egg in a large bowl until fluffy. Add 3/4 cup cheddar cheese, 3/4 cup Jack cheese, milk, flour, baking powder, salt, and cottage cheese. Heat a large nonstick skillet over medium-high heat. Coat pan with cooking spray. Add zucchini and the next 3 ingredients (through mushrooms); sauté for 5 minutes or until tender. Add the zucchini mixture and parsley to egg mixture. Pour mixture into a 3-quart casserole dish coated with cooking spray. Top with the remaining 3/4 cup cheddar cheese and 3/4 cup Jack cheese. Arrange tomato slices over cheese. Bake at 400F for 15 minutes. Reduce oven temperature to 350F (do not remove dish from oven), and bake for 35 minutes or until lightly browned and set. 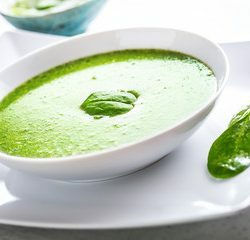 Broccoli Cheddar Soup or Tomato soup to dip and dunk! 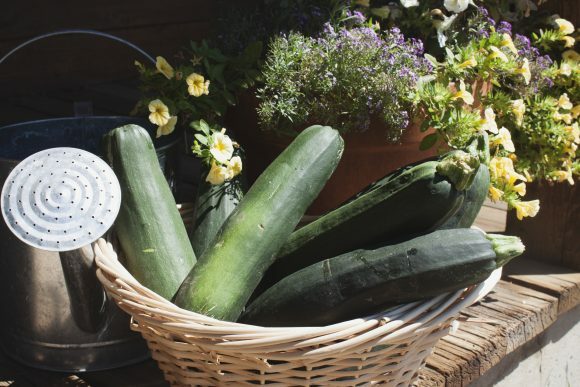 Grate zucchini on a box grater, then squeeze excess moisture with a clean kitchen towel. In a large bowl, mix grated zucchini, egg, Parmesan, green onions, and cornstarch. Season with salt, pepper, and red pepper flakes. 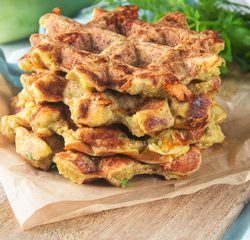 Heat a waffle iron and pour in ⅓ cup of zucchini mixture. Cook until golden, about 3 minutes. Continue with the rest of mixture. Place one waffle back into the waffle iron and top with ½ cup cheese. Top with another waffle and cook until cheese is melted. Repeat with remaining waffles and cheese. Preheat oven to 350F. 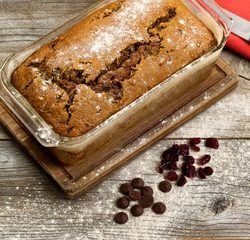 Grease a loaf pan and dust with cocoa powder. In a large bowl, whisk together flour, cocoa powder, baking soda, cinnamon and salt. In another large bowl, stir together sugar, egg and egg yolk until smooth, 1 minute. Add melted butter and vanilla and mix until smooth. Add zucchini, then add flour mixture in 3 additions. Fold in chocolate chips. Transfer batter to prepared dish, sprinkle extra chocolate chips on top and bake 50 minutes. Let cool slightly in pan, then transfer to a cooling rack. Sprinkle with flaky sea salt and serve. Cut the top third of the garlic off and discard. Place the garlic head into a piece of foil and sprinkle with salt and pepper. Add some olive oil and enclose in the foil. Put into the oven and roast until golden and tender, 30 to 35 minutes. Increase the oven to 375F. Place the poblano on a sheet pan and into the oven. Roast, about 25 minutes. Remove the poblano from the oven and place into a bowl. Cover with plastic wrap and allow to steam, about 10 minutes. Peel, stem, seed and dice the poblano. Set aside. Place the diced potatoes into a pot and cover with water. Season the water with salt and turn the heat to medium-high. Cook until tender, and then drain. To a cast-iron pan over medium-high heat, add the butter, canola oil and shallots. Allow the shallots to sweat, 2 to 3 minutes. 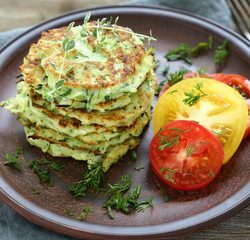 Add the drained potatoes and zucchini in one layer and allow them to crust and brown, about 5 minutes. Add the poblano and piquillo peppers. Smash 2 of the roasted garlic cloves and toss to combine. 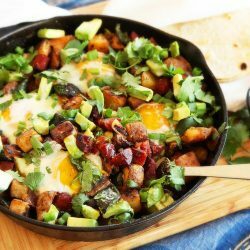 Add the cilantro and toss to combine. Taste and season if necessary. Adjust oven rack to middle position and preheat oven to 400F. Toss squash and onion with 3 tablespoons olive oil and season generously with salt and pepper. Turn onto a rimmed baking sheet and roast, stirring once or twice, until vegetables are tender and browned, about 20 minutes. 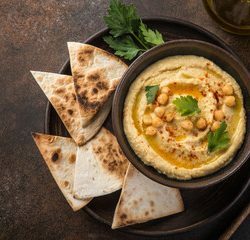 Scrape dip into a serving bowl, drizzle with 1 additional tablespoon olive oil and sprinkle with za’atar. 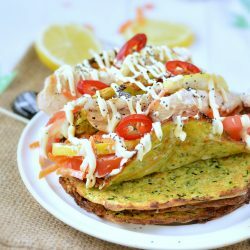 Serve with toasted flatbread.